Located on the southeastern edge of the Blue Ridge Mountains, Hendersonville, North Carolina, was settled relatively late as its lack of navigable waterways and usable roads precluded economic development and population growth. The completion of the Buncombe Turnpike in 1827, which connected Greenville, South Carolina, to Greeneville, Tennessee, led to the incorporations of Henderson County in 1838 and Hendersonville as its county seat two years later. Yet like so many other Southern towns, it was the coming of the railroad in 1879 which led to Hendersonville’s growth as local farmers and businesses were now linked to national markets. Due to its mild climate and scenic beauty, Hendersonville also developed as a significant summer tourist destination. During the late 19th century, Hendersonville grew as numerous stores, hotels, and rooming houses sprouted up to cater to the wealthy and middle class vacationers who flocked to town each summer. Jews first began to settle in Hendersonville around the turn of the 20th century, laying the roots for a community that lasts today. Ad celebrating the Lewis Dept. Store's 38th anniversary. Edward Lewis left Polish Russia in 1887. After five years, he brought over his wife Ida and two young children. The family first settled in Montgomery, Alabama, where Edward had a brother. During the local yellow fever epidemic of 1897, Edward decided to move to a healthier climate, settling in Saluda, North Carolina. When his store there failed, Edward moved on to Hendersonville in 1900 and opened the E. Lewis & Son dry goods store. His son Abraham joined him in the business. The store was a family operation as Abraham’s sisters Lena and Rose also worked there. Edward Lewis was the first in a wave of Eastern European Jewish immigrants who soon settled in Hendersonville. Lewis was followed by Harry Patterson, who came to the United States from Russia in 1899. After a few years in Kentucky, Patterson and his family moved to Hendersonville in 1906. In 1910, he was a tailor who owned his own shop. During the next decade, Patterson opened a dry goods store that quickly grew into one of the largest department stores in the area. The Patterson and Lewis families served as the cornerstones of the Hendersonville Jewish community for the next few decades as they brought several relatives to the area. Harry Patterson brought over his 13-year-old nephew Alex Patterson in 1909. Alex worked at Patterson’s Department Store and lived with his uncle for the next several years. Russian-born Nathan Brenner also worked at Patterson’s store, and married Harry’s daughter Rebecca Patterson. Brenner later opened a successful store of his own. Morris Fred was Henry Patterson's brother-in-law, and was working at the family department store in 1920. Harry Mottsman, a nephew of Harry Patterson, came to Hendersonville from Brevard, North Carolina in 1929 with his wife Pearl and their children. Mottsman opened a general merchandise store in town. Abe Kantrowitz, a native of Virginia, married Edward Lewis’ daughter Lena, and went to work at the Lewis & Son store. Kantrowitz later bought a local shoe store. George Lazarus and Hymie Cohen, both Russian immigrants, lived with Ida Lewis in 1920 and worked in the Lewis Dry Goods Store; Edward Lewis had died a few years earlier. Beryl Cohen, another Lewis in-law, came to Hendersonville in 1920, when he was only 19 years old, and worked at the Lewis store. In 1921, according to the Hendersonville City Directory, the large majority of adult Jews worked at either Patterson’s Department Store or E. Lewis & Son. 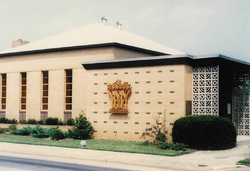 In 1922, the growing Jewish community of Hendersonville came together to form Congregation Agudas Israel. Twenty-seven men and women attended the founding meeting held at Abe Kantrowitz’s home. Hendersonville Jews had been meeting together informally to pray in people’s homes prior to the founding of the congregation. The group continued to meet in private homes, and later used the local Masonic Temple. Henry Patterson was the president of the young congregation. 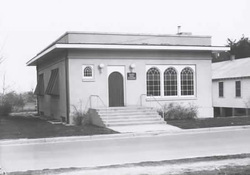 In 1925, Agudas Israel purchased an old electric company building which they converted into a synagogue. That same year, congregation member Louis Williams brought his younger brother, Chaim Williamowsky, to town to serve as the congregation’s rabbi. Williamowsky had been ordained by an Orthodox rabbi after attending the Slobodka Yeshiva in Lithuania. Williamowsky led services, taught Hebrew to the children, and slaughtered kosher meat for the Orthodox congregation. The rabbi taught Hebrew School on Tuesday, Thursday, and Saturday afternoons. Williamowsky visited each member’s home three mornings a week to slaughter their chickens and cows. He was also responsible for visiting the sick and having the synagogue heated and ready for Shabbat services. With only 34 members, Agudas Israel had a hard time paying its full-time rabbi; in December, 1926, the congregation’s Ladies Auxiliary held a series of entertainment events to raise money for the rabbi’s salary. Perhaps Rabbi Williamowsky’s duties were too demanding; members began to complain about his performance in 1927. In April, the members of Agudas Israel voted to send a letter to the rabbi “requesting that he give more attention to his duties” and that he carry out the orders of the congregation. They also voted to call a special congregational meeting if the rabbi did not improve his performance. Despite this conflict, Williamowsky remained at Agudas Israel until 1930, when he moved to Durham, North Carolina to lead another Orthodox congregation. Beryl Cohen took over many of Rabbi Williamowsky’s duties, leading services, teaching Hebrew, and slaughtering chickens for the congregation. This was only a part-time position; Cohen worked as a clerk at the E. Lewis & Son store and later a local furniture store to supplement his income. Cohen served Agudas Israel until his death in 1964. Hendersonville continued to grow as a summer resort destination. By 1926, the town’s year-round population of 10,000 quadrupled each summer as people from around the South sought refuge in the cool mountain air of western North Carolina in the days before air-conditioning. Jews were among those who vacationed in Hendersonville. Five different Jewish-owned boarding houses opened in town, catering to Jewish tourists from Florida, Georgia, and South Carolina. Three of these boarding houses served kosher food, as they would hire a full-time shochet to slaughter beef and chickens during the summer. During the High Holidays, Jews from the small towns in the region would stay at the boarding houses and attend services at Agudas Israel. Many still remember the lavish Rosh Hashanah meals the boarding houses would feed its guests after services. A few of these Jewish boarding houses survived into the 1960s, including Horowitz’s and Rubin’s, though Hendersonville’s days as a Southern version of the Catskills have long passed. Although the kosher boarding houses have all closed, Hendersonville still attracts hundreds of Jews each summer who attend Camp Blue Star. Founded by brothers Herman and Harry Popkin in 1948 in north Georgia, the camp moved to Hendersonville two years later. The Popkins got the idea for a Jewish camp from another camp director who told them candidly that since so many summer camps did not accept Jews or had strict quotas, there was a need for a camp that catered to Jewish kids. Three generations of Popkins have owned and operated Camp Blue Star ever since. Herman’s son Rodger Popkin took over the camp in the 1970s. Rodger’s children, Jason and Lauren, run the camp today. While Camp Blue Star is privately owned and not affiliated with any national Jewish organizations, it has a kosher kitchen and offers strong Jewish content in its programs. Jews owned a wide array of other businesses in Hendersonville, especially retail stores, several of which were still in operation in the 21st century. Louis and Rosena Sherman opened a sporting goods store on Main Street in 1922, which remains in business today. Their son, Kalman Sherman, took over the business in the late 1940s; since Kalman’s retirement, his daughter and son-in-law have run the store. Morris Kalin opened a furniture store after coming to town in 1929. Kalin’s Furniture remains in business today. Louis Williams opened a hardware store, which has continued to be family-owned ever since. Morris Kaplan married Louis’ daughter Anne, and ran the Louis Williams & Sons Hardware Store for several years with his brother-in-law Sam Williams. Daniel Williams runs it today. Daniel Michalove owned a railroad salvage and furniture store, while Jack Michalove had a wholesale hosiery business. Most Hendersonville Jewish merchants would close their stores on the High Holidays, including two days for Rosh Hashanah, maintaining their observance of Jewish traditions. After World War II, many members of Agudas Israel still kept kosher as Beryl Cohen continued to slaughter chickens while they would order kosher beef from Charlotte or Atlanta. Despite their adherence to these Jewish commandments, most had to keep their stores open on Saturday in order to survive economically. Agudas Israel thrived during the 1950s. The congregation moved away from Orthodoxy, embracing Conservative Judaism. By the end of the decade, they had over 50 children in their religious school. In 1958, the congregation bought land for a new synagogue, but soon their numbers dropped. Many of the children raised in the congregation did not return to Hendersonville after college. During the 1960s, there was talk of closing the religious school. Faced with this decline, Agudas Israel postponed plans for a new building and sold their land to the local YMCA, using the proceeds to refurbish their King Street synagogue. Agudas Israel relied on student rabbis during this period. Although their numbers were declining, from 135 Jews in 1960 to 100 in 1968, Hendersonville Jews became important leaders in local civic life. Early on, Jews faced a degree of social anti-Semitism; they were initially excluded from the local country club. Over time, their contributions to Hendersonville were recognized by the larger community. Don Michalove served as Hendersonville’s mayor during the 1980s after previously serving on the city council. Morris Kaplan, who came to Hendersonville after World War II, helped found the Community Foundation and served on the boards of the local Red Cross and YMCA. Kaplan spent over 30 years as chairman of the Henderson County Public Library Board. Under his leadership, the library established four branches in the county. In recognition of his service, the central library’s auditorium was named in his honor. For over 50 years, Kaplan led the Kiwanis Club’s free shoe program for needy children. Kaplan also spent many years on the Hendersonville Urban Redevelopment Commission. Kaplan served as president of Agudas Israel for over four decades. In recent years, Agudas Israel and the Hendersonville Jewish community have grown as an increasing number of Jews, especially retirees, have moved to the area. In 1996, these new members pushed the congregation to officially join the Reform movement. By 1997, Henderson County had approximately 250 Jews while Agudas Israel had 86 individual members, with an extra 64 members during the summer. In 2000, the congregation started a building campaign to construct a new synagogue. Two years later, Agudas Israel’s longtime dream of a new house of worship finally came to fruition. In 2005, the congregation hired Rabbi Phillip J. Bentley, the first full-time rabbi they had employed in 75 years. Agudas Israel had 129 members in 2009. Today, the Hendersonville Jewish community, with its growing population of retirees, is as large as it has ever been.